More recent Tweets, some find Grizzly Tales a bit scarey. 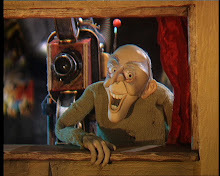 Grizzly tales for gruesome kids.. Am I tha only 1 that finds that a lil scary??? Grizzly Tales for Gruesome Kids is on! I had a love/hate relationship with that show when I was little. It freaked me out. i'm s***ting myself at grizzly tales for gruesome kids. Was Nigel always a Gruesome Kid?